The past gets retold in many ways. You can mimic it. You can change it. You can enhance it. In their string quartets, Mozart, Janacek and Beethoven each altered the past, but embraced it as well – lovingly, ironically, brazenly. 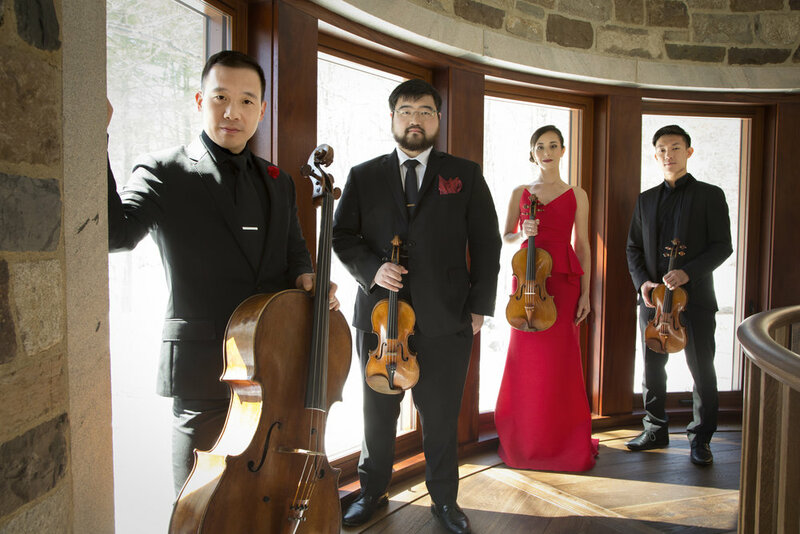 In the hands of the adventurous Parker Quartet, this string quartet history came to life Tuesday evening at the Cotuit Center for the Arts. The Parkers were beginning a weeklong residency that closes the Cape Cod Chamber Music Festival. Their three-concert series started with a program of standard works that defy changing tastes, remaining pertinent, engaging and occasionally shocking. Mozart revered Haydn. When you hear Mozart’s E-flat major quartet, the fourth in his sextet of so-called Haydn quartets, it’s impossible not to imagine the premiere in 1783, with Haydn himself playing violin, and Mozart playing viola. Richly contrapuntal, featuring intense interaction among all four players, the Parkers were not content just to read through this balanced work. Risk-taking was the order of the day, and the performance benefitted from it. Such playing does not always result in perfect notes, but most of the time – as it did here – it rewards the audience with music that feels alive, even after centuries. So what if some intonation is not exactly on the mark. An example was the remarkable “sneeze” (some call it a braying donkey) that begins the minuet scherzo. It’s a phrase – one surging note, with a unison chord following – so malleable it can sound offensive or inviting, depending on the players. The Parkers articulated it multiple ways – all intriguing – as it was repeated dozens of times throughout the movement. The finale of the quartet teases with two ideas – one energetic, one reserved. When violist Jessica Bodner listened in astutely to first violinist Daniel Chong, while he led the group through the shifting moods, one imagined Mozart doing the same as Haydn led that quartet performance more than two centuries ago. Cellist Kee-Hyun Kim and violinist Ken Hamao round out the quartet, which next brought its enhanced collaborative skills to Janacek’s desolate “Kreutzer” quartet. Here was musical storytelling at its most intense. And the best example of the past being recast by different artistic minds. Beethoven wrote the sonata. Tolstoy wrote a short story about the Kreutzers, and the sonata. Then Janacek brought Tolstoy’s characters – the unhappy pianist wife; her empathetic, violin-playing friend; and her agitated, jealous husband – to life musically. Now everything is remembered by the name Kreutzer – the sonata, the story, and the quartet – and they culminate in Janacek’s riveting work. Janacek wanted to protest the tyranny of men over women – and here he does it. Many of the phrases in the piece come as statement-and-answer – some ironic, some emphatic, some hesitant. Styles veer wildly – the most notably technique being harsh, ponticello playing, alarming and aggressive. Janacek only recalls Beethoven’s sonata briefly, a short thematic quote in the third movement. But his re-creation of the tense, doomed story of the imagined love triangle makes a great Tolstoy story even greater through music. We weren’t done with Beethoven. The Parkers concluded this bracing concert with his second Razumovsky quartet, from the set of three works that highlight the composer’s middle period. Here history gets retold as homage: Beethoven acknowledging Count Razumovsky’s stalwart and generous support. Beethoven does it simply – a short Russian theme in the trio section of the scherzo. But while the theme may be brief, the intense, engaged quartet is anything but. The Parkers made it a conversation – almost like a table reading of an excellent manuscript. Of particular note: multiple, two-note intervals, all different, elucidated by Kim on the cello in the slow movement, as his quartet partners swirled melodies all around him. The Parker Quartet makes its next Cape Cod Chamber Music Festival appearance on Wednesday at Dennis Union Church, 713 Route 6A. The Parker Quartet closes the festival on Friday at Wellfleet Congregational Church, 200 Main St.
Aug 31 Opera Theater of Cape Cod debuts with The Tragedy of Carmen.